I glanced out of the office window on a drab November morning, only to see a sleek, white stretch limo pull up onto the street curb. Glittery, miniscule lights shaped like stars lined the passenger windows. After a pause, I saw the chauffer walk around, open the door, and out skirted a man with a dark robe and a beige dunce’s cap. But this was no dummy. As he meandered his way towards the office door, to avoid tripping, he lifted the bottom of his robe over his patent worn leather sandals. Distracted by the unexpected imagery, only then did it fully hit me: Nostradamus was paying us a visit! While sauntering in, he tilted his head below the door to avoid clipping his hat. His hand felt as weathered as an art canvas as I shook it. His eyes were beady and piercing, but non-threatening. I waved at the chair opposite the office desk as he settled himself in it, the air within his robe deflating like the sifting sound of truck tires at a service station. His long, gray beard reminded me of Spanish moss as he smiled slightly back at me. Silence. I need to remember to never ask Nostradamus where he is going, or where he has been. Coffee? There’s a fresh pot…..
Nah, gave up the stuff. Even decaf. Some say it’s bad for your heart. Got any prune juice? Um, no, but there’s a store down the street….your driver could…. OK, not too much time, so I’ll get right to it…..
First of all, I think you people are nuts to be Saints fans. I’ve been watchin’ them on TV the past month. You never know which team is gonna’ show up. And these needlessly close finishes! Do portable heart monitors come with season tickets? You beat the Colts, setting records, 62-7, and the faces of their owner in the press box, the head coach, Jim Caldwell, Peyton Manning in civvies, and Reggie Wayne, all look on as forlorn as any I have ever seen on human beings at a football game. It looked like they were state officials, dutifully sitting in behind windows to witness a capital punishment about to take place. You humiliated a proud franchise. How do you think fans in Indy felt watching that, the memories of the Super Bowl 44 still fresh in their minds? It didn’t look like the Saints were running up the score, though Brees should have been pulled earlier. Peyton and the Colts tore up the Saints here, in the ensuing season opener in prime time, after the magical title run in ’06. Nobody felt sorry for us then, so to speak. Then, the next week, you go to pitiful, winless St. Louis to play the Rams, and you are there only in uniform. The Rams had led over their opponents for only six minutes ALL SEASON, and they never trailed against you. Your team looked like the post Katrina Saints of ’05, sleepwalking in an abyss. It was so bad, I am surprised rumors of a fix being in did not surface. Glaringly, it looked like there were serious problems in your locker room that nobody in the media had a clue about. You had an offensive lineman fighting with his position coach on the sidelines. The risk at that point was implosion. Your team shrink had to have a case overload in his appointment book. You had potential material for a new book on your hands, A Tale Of Two Weeks, Penthouse To Outhouse….. It was a head scratcher for sure, and that following Monday was a redo of S.O.S. blues from the past. But the Saints have always mesmerized us like this, and we are kind of conditioned for it, those of us old enough to remember. Regarding the locker room, there was buzz that Drew Brees’ agent lives in St. Louis, had met with Saints’ brass that weekend, but that no new long term contract got done, and that this was a distraction for #9…and not helping team morale, since he had been so prominently player supportive during the lockout. Yes, what’s up with that? The guy’s not going to go hungry, but that isn’t the point. Brady got redone after a year off to injury, as did Peyton Manning, bad neck and all. What do the Saints want Brees to do for an encore, fly to the moon and back? The front office is pushing the envelope with this. He is at the age where stuff happens, a big liability for the remainder of your season, so keep knocking on wood. Backup Chase Daniel seems like a good kid, well versed in Sean Payton’s system, but is woefully untested. Tossing a few TD passes on Friday nights in August has zilch to do with needing a long drive in the last two minutes to win in December. Agreed. Over the past few years, there have been several instances where Daniel could have gotten more playing time in a regular season game, even if the outcome was already decided. Anyway, your last two outings over Tampa Bay and Atlanta were workmanlike, professional efforts, and critical wins, though you almost gave it up with a lackadaisical last five minutes against the Falcons, making it closer than it should have been. Though the Atlanta coach made a bad decision to go for it on 4th and inches in overtime, somebody had to penetrate their offensive line and stuff fullback Michael Turner, who is a load. After two division wins, your season has been saved from mediocrity. At 7-3, you are still a top third tier team, poised for a stretch run, and the timing for a bye and rest this week is quite good. I could see Nostradamus eyeing his limo through the window on the street, the hazard lights flashing. I felt inclined to ask the question of what would become of the Eleven Saints, but he pre-empted me. Your Saints will go as far as an improving defense will allow them to. In the past two games, I noticed you made crucial stops on the ground on 4th and short, found some teeth in the unit. This looked impossible earlier in the season. Cornerback Jabari Greer was outstanding in blanketing Falcon wide receivers on Sunday. And Roman Harper wreaked havoc around the line of scrimmage. You miss the productivity of a healthy Vilma at linebacker, but Dunbar can have an impact. And maybe all your new defensive linemen will jell better. Get the rookie end Cameron Jordan out there more! But these defensive lapses that result in vacuous ground and big plays have to be minimized. Lack of turnovers get the ink in your papers but the kety to your defense is playing good in the red zone, like you did on Sunday. Defensive coordinator Gregg Williams may be too blitz happy considering your defense is not particularly fast. On offense, expect opponents to pay more attention to the budding superstar Jimmy Graham, but that should open up more for secondary wideouts like Lance Moore and Devery Henderson. You need to get Chris Ivory back at 100% physically, and work him into the fold in a major way, though I like what I see of the rookie Ingram, he having upside to do more damage inside. Darren Sproles has been a plum of an addition, without whom you’d already be an also-ran. Your offense does have lots of choices, and in the press box or not, the head coach continues to do an admirable job in managing them. We like Coach Payton. And like seeing him gesturing with his crutch on the sidelines, as in ‘first down Saints’. Your schedule is favorable, having the two most important of the six remaining games, against the Giants and Falcons, at home. The Lions are fading, but your team’s slippery psyche seems vulnerable to drifting on the road against a team like the Titans. But you should finish no worse than 11-5, which should be good enough to win the division, though not as a 2nd conference seed behind the Packers, as San Francisco may have already stolen that. You will need three wins to get to the Super Bowl, one at home, and maybe, just maybe, a hot wildcard such as a Dallas might upset the Pack after a week off, but don’t bank on it. If you make it to Green Bay for the NFC title though, and it’s cold and frozen in January, Coach Payton needs to remember to practice his team outside the week before, not inside, as was the case when the Saints went to Chicago and lost in ’06, when it showed they were not as primed for the conditions. And pray that the Packers, like the ’07 Patriots, will have peaked in mid-season. You have shown that you can hang with them though, and their defense can be scored on. As he pressed the arms of the chair in getting up to leave, I had to pose the question: Are the Saints going back to the Super Bowl? I have a reputation of predicting the future, but what I really do is crystallize the possibilities. I wouldn’t have wasted the gas to come see you if I did not think the Saints were not a top contender to make it back to the big dance. The Saints have a veteran team with many players in their prime, the core of them having done this before. You would be wise to keep the faith. The Saints just have to keep their heads screwed on right and play for 60 minutes; when they don’t, they become their most formidable enemy. With that, Nostradamus nodded goodbye and scurried out the door. As the tail of his black robe fluttered out, I noticed a myriad of haphazardly stitched gold sequins on it. One was of a fleur de lis. 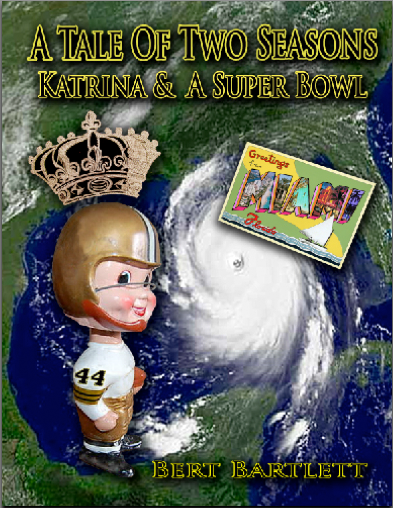 The book A Tale Of Two Seasons, Katrina & A Super Bowl, was accepted by the curators of the Saints Hall Of Fame as an exhibit in the Superdome. At this year’s Saints Alumni Gala, orchestrated by Ken Trahan, it was fun meeting up with former Who ‘Dats like Vaughn Johnson, John Fourcade, and Rickey “City Champ” Jackson, as well as the Saintsations. The sundry restaurants that catered the event did quite well for the attendees. Kudo Cajuns Metairie Park Country Day’s girls’ varsity volleyball team just won its third straight state championship, and the boys’ varsity football team concluded another successful season by participating in the state playoffs. Takes cojones to ask ol’ boy Nostradamus where he’s heading my friend – well played!